Spacious and luxurious three-bedroom, two-bathroom vacation home, ideal for a family of six. This corner unit has magnificent windows framing panoramic views of the lake and valley. 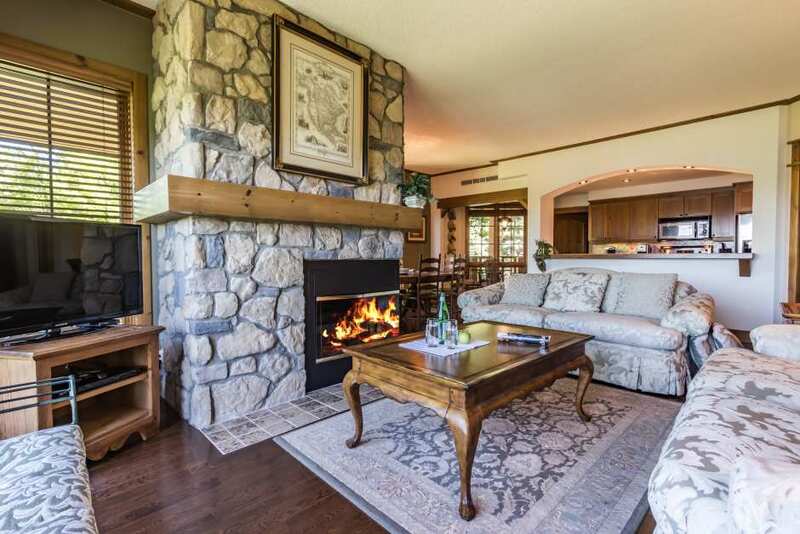 Guests will be enticed to lounge on the big, comfy couches in front of the fireplace. The kitchen is well-equipped for making tasty meals, with plenty of counter space to put guests to work chopping and dicing! The master bedroom invites well-deserved rest and includes a full bathroom and balcony. In summer,the air conditioning ensures perfect temperatures after a fun day out or time spent by the complex’s large pool. Two TVs, a DVD player, a compact sound system and wireless high-speed internet provide entertainment if desired. The only thing you might lack is time to fully enjoy this sumptuous property, which has been carefully designed for maximum comfort and enjoyment.